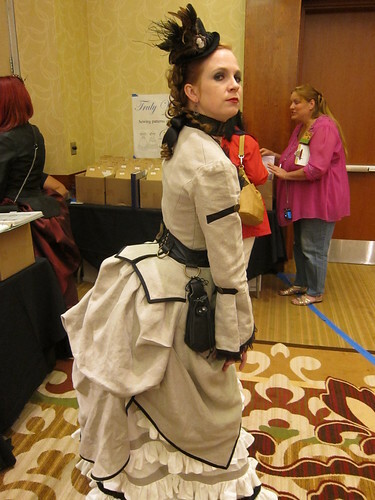 Last weekend was Costume College, and it was pretty awesome. There were some classes that were a total let down, but all-in-all I had a great time. I went down to LA from the Bay Area with my two friends, Amber and Wendy, for whom this was their first time. I had gone last year and reported it to be pretty awesome, so they decided to join. 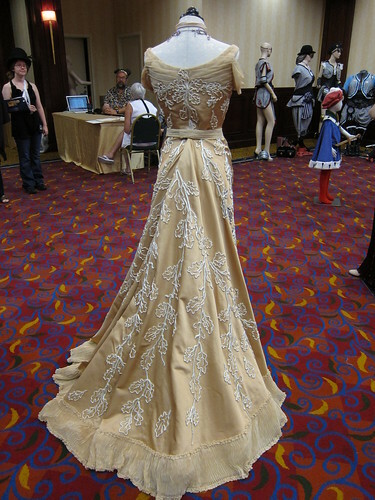 If you have never been and you are into costuming, you should go. It's likened often to "summer camp for costumers", and it really is. There are people roaming the halls in the most beautiful of outfits, usually created by themselves, and sometimes even by hand. The craftsmanship involved in most of the dresses walking around is astounding. I hope, someday, to be as good at this as these people are; sadly, or happily, I have to wide an interest-range in my hobbies to actually dedicate a severe amount of time to being that awesome. Thursday: Work from home and leave for LA around 3:00. Arrive at the hotel at 8:30. Go swimming. 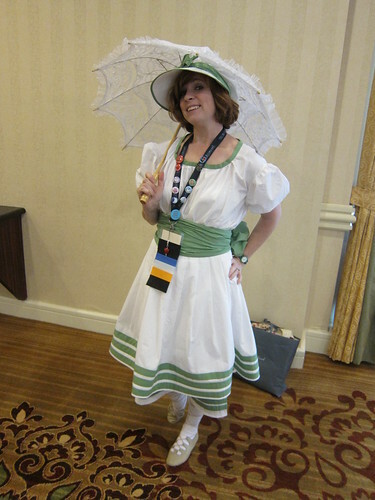 Friday: The highlight of my day was attending the covering parasols class, which is something that I have wanted to do for a long-long time. I also sat in on a wig making class, learned how to master a crazy huge project from Cathy Hay, learned how to bind 18th century stays, which I am actually stuck on right now (OMG, thank jeebus that I saw that, now I feel much better about that project! ), and had a regency overview. All-in-all a productive day! 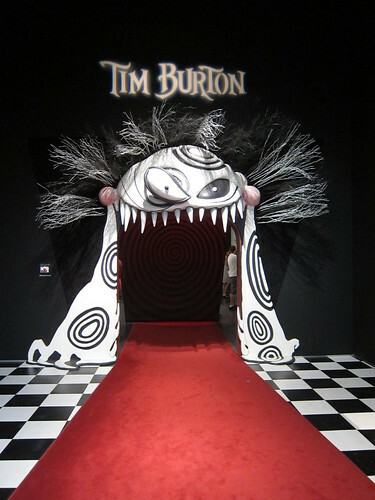 After College, we bailed out on going to the ice-cream social in favor of attending the Tim Burton Exhibit at the LACMA. If you have not seen this and are able to, it's well worth your time and money. It's beautifully done and there are hundreds and hundreds of original drawings, paintings, statues, some costumes, and movies on display. It was a fantastic exhibit. Saturday: Highlight on this day was the Victorian Circus class, which was a lecture both on the history and on the costumes, with modern recreated examples. 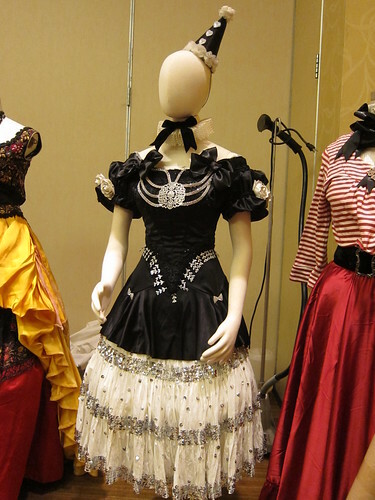 The instructor was really excited and knowledgeable about the subject and her costumes were extremely charming. I am totally into making one of these now! Also, there was a class on the fabrics of star wars, which was a fascinating look into using heat guns and other techniques to get really cool textures out of your clothing. The instructor here was pretty great at passing out examples and describing the technique thoroughly. I feel pretty well prepared to go add some texture and dimension to future costumes now! I also went through the shopping area and started to get a feel for what I wanted to pick up while at the event this weekend. I took a limited hat making class in the afternoon, but I think I was just to far advanced for what was happening, combined with me not getting what the description was saying and the description not being exactly what happened. I spent a few hours making a paper hat, basically. Kind of sad, but this teaches us to be super careful about what limited classes we pick, and read and interpret according to your own skill level. So, lesson learned. 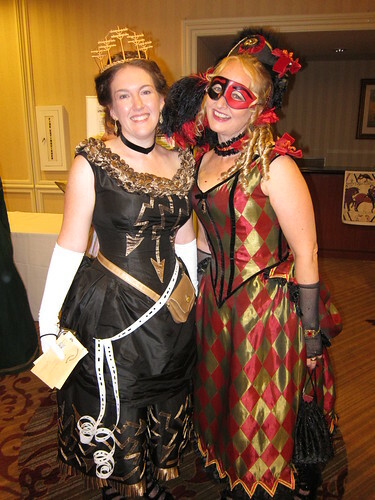 Saturday night was the Gala Ball, which I did not attend last year. We got dressed up and went down for dinner, dancing, picture taking and a LOT of ooohing and ahhhing at people's handy-work. This is usually the event that everyone wears their finest to, and that people slave months over to have gowns for. 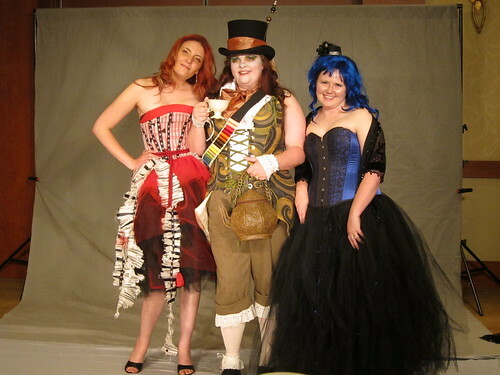 (I went as the mad hatter in a not-slaved-over costume that I already had). Sunday: I learned to embroider! Whoo-Hoo! I have been terrified of this for years, but it is really very easy! I took the class in hopes that i would at least learn something that would help me hand-sew better, and I think I came away with a new hobby. I also took a class on the silk road, learned to make bows, piping and scallops in a really easy way and sat in on a class teaching modern corsetry techniques, which I knew most of, but was happy to review and learn new tricks. I ran through the shopping area one more time, and came away with a bunch of really nice lace that will sit in a box until I figure something out to do with it, but now at least it will not haunt me when I need it! Sunday night, we had the absolute pleasure and privileged to attend a preview of Iris, a permanent show in LA by Cirque du Soliel. I cannot describe how beautiful it was. It made me cry. Literally. I have seen something on the order of 10 Cirque shows, and this is by far my favorite. Not only because of the fact that Danny Elfman scored it, and that is masterful in itself, but also because of the acts contained within and the way that the history of cinema was threaded through the show. Amazing. Go see it. It is absolutely worth your time and money. Monday: Monday was the day of doom. The fabric district all day and then a 6 hour mad-dash home so that Wendy and I could work the next day. This is a lot in one day to begin with, but we sadly learned the night before that Wendy was getting pretty sick. Ugh. She was a total trooper though and drugged herself with Advil cold and sinus enough to power along way after Amber and I crashed out on the bus. We went to the hat making store, got fabric for what I think is 4 dresses, feathers for hats, lots of hat forms, and miles and miles of trim, just because. I think I will soon need a bigger garage. Then we headed home, sad to be done with College, but exhausted and ready to be home and not to have an agenda for a while. Photos of the whole weekend can be found here, if you are interested! If you are interested in Costume College for next year, they do have a website that you can bookmark for the future - I would guess it would get updated in the Oct/Nov timeframe and signing up early is a good idea. :-) I know I can't wait!